Teamsters who worked for the Minneapolis Park Board began working 8-hour days in 1913. With only a quick look into the history of the eight-hour workday, that strikes me as a fairly early concession by the park board. Many industries still worked longer days. The park board Proceedings for 1913 reported that park commissioners adopted this proposal on May 6, 1913. Your Standing Committee on Employment, to whom was referred the communication of the International Brotherhood of Team Owners asking that eight hours constitute a day’s work for teams employed by the Board, respectfully reports that the matter has been given careful consideration and your committee now recommends that all teams and men now employed by the Board working nine hours per day be placed upon a basis of an eight-hour day at the same wage per day now being paid. Nothing in park board proceedings indicates why employees were given what amounted to a 12.5% raise that year. Pay rates published in the February 18 proceedings list teamster pay at $2.50 per day and pay for teams at $5.00 per day. In other words, a driver was worth the same as a horse. You have to keep in mind that a teamster in those days was usually someone who drove a “team” of horses—thus “teamster”—not a truck, in case you’ve ever wondered. 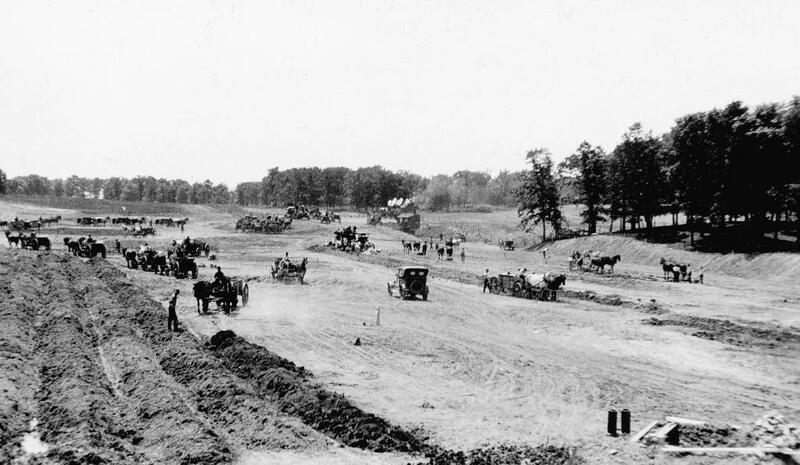 The photo above, taken a few years after the reduction in work day was approved, shows that horses and automotive vehicles worked side-by-side on road construction. Theodore Wirth wrote in 1911 that some projects had been delayed in Minneapolis parks because there were no teams to be hired. Perhaps the shorter workday was necessary to compete for teams in 1913. I know that a widespread 40-hour work week didn’t come for many years in some places and some industries. Perhaps someone with a better knowledge of labor history than I can provide some context for the decision of the park board to reduce the work day from 9 to 8 hours, but maintain the same pay. Also is there any significance in the request for shorter work day coming from the brotherhood of “Team Owners,” which I gather was not the same as the International Brotherhood of Teamsters. Any thoughts? Slaughterhouse 5 on the Parkway just north of Lowry with the North Memorial ambulances. Thanks, Jim. You might be interested in a 1921 design for that intersection created by Phelps Wyman, a landscape architect and park commissioner. The plan in the middle of the linked post appeared in the 1929 annual report of the park board.